I've been hearing about Descent Into Midnight for quite some time now, but this is the first chance I've had to play it, and honestly it feels like the game is pretty mature to me. This is a Powered by the Apocalypse game about undersea alien civilizations. There are no humans in this game, which I appreciate; it's a totally alien environment, and you can go wild with the character creation. Owing to the PbtA nature of the system, the mechanics are heavily about narrative, so the...physics, let's say...of the individual characters aren't so much a big deal. You can really let your imagination roam when designing your character's species. One of our characters (mine) was basically a featureless sea slug, while another was pretty much a miles-long tentacle anchored in the space where the rest of us lived. The game is highly focused on the emotional experiences of the characters and the community they are a part of. It promotes a lot of problem-solving and caring during play. The pregame includes collaborative worldbuilding (and mapbuilding!) which you know I enjoy. 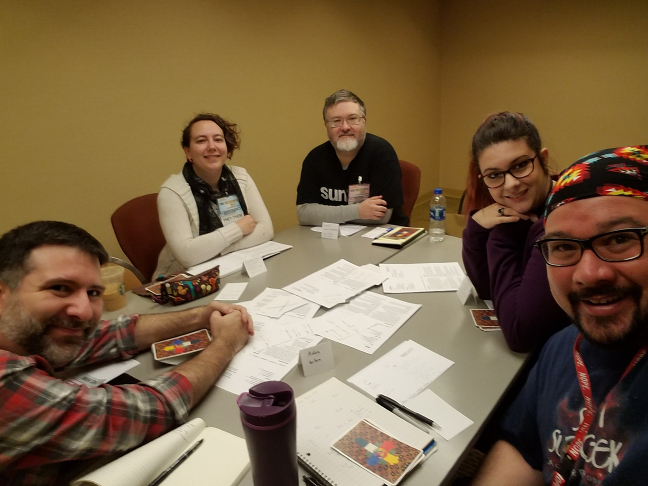 This particular playtest also featured an eye-popping seven players, which I think pushed the limits of things a little, but it was still a good time. Taylor himself is an excellent guy, a tremendous GM, and also a vocal proponent of all things queer in tabletop. 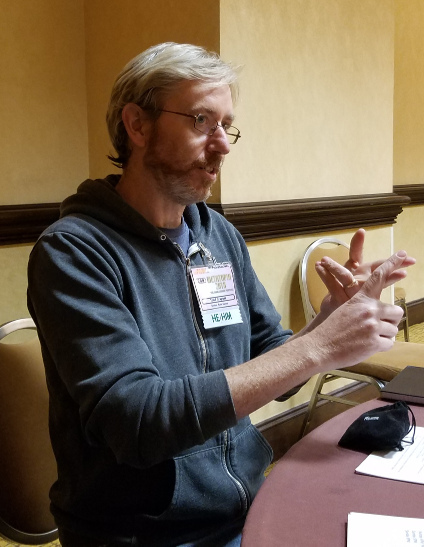 I encourage you to explore his many fine works over at Riverhouse Games, including his excellent interview podcast Game Closet. Plus keep an eye out for his upcoming game Thirteen Demon Princes, to which I am also a proud contributor! I'm looking forward to seeing Descent Into Midnight get completed, of course, and have been for a while. You can find a bunch more information about the game (including free downloads of the playtest materials) at the Descent Into Midnight website. I was drawn to this game for three reasons. One, I'm familiar with the designer from The Gauntlet, so I'm always happy to see what's cooking from a fellow Gauntleteer. Two, urban fantasy. Three, I like tarot-based and similar prompt interpretation mechanics. This game was a lot of fun, and I'm definitely eager to see more. I've found the term "urban fantasy" covers a wide range of tones, so on my own scale, I'd call this one a lot closer to Dresden Files than Vampire: The Masquerade. It was mechanically pretty sleek: descriptive traits, keys for advancement, conditions instead of hit points. There was a single shared deck for everyone at the table, but everyone had their own hands as well. Task resolution used only the cards, but they could be used either numerically vs. a target number or interpretively (by player choice, which I think can work well). I think I was the least knowledgeable about tarot of all the people present, and I greatly enjoyed a discussion about different deck types and their respective suitability as a basis for the game's mechanics. It's a little thing, but I think it really highlights part of what's special about Metatopia; it may be easy to find people with shared interests, but here you know if you find people with the shared interests you're looking for, they're also passionate and knowledgeable about game design. The playtest session was a murder mystery setup, but I don't think this is particularly a mystery game. It really is more of a story engine, which I certainly appreciate. It's pretty freeform, and I think can be a lot of fun, and part of the reason I like tarot-based games is because you can bring a lot to the game with a themed deck. I'm definitely keeping an eye on this one! You can check out more of Jason's work (and hopefully more about this game!) at Pretendo Games, where you can find his blog and also free downloads of some of his other games currently in open beta. Check it out! This was an unusual playtest in many ways, but the big one was that the presenter didn't run the game! 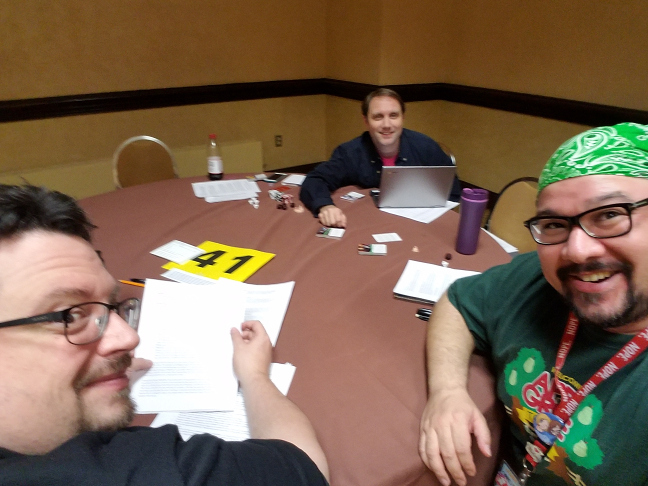 This session was meant to test some GM-facing materials, so one of the attendees (Phil) was asked to try running the pre-written scenario cold for Eric and I as players. Another unusual thing was the sheer gonzo of the setting. In talking with Eric later, I was apparently rare in enjoying it! It's sort of a war-in-Heaven situation, except Heaven was designed by the psychedelic 70s aesthetic and, I don't know, Flash Gordon. I was into it. I didn't know it at the time, but I was later to learn that this game is an RPG adaptation of the setting in the Lucifer: Soldiers, Serpents, and Sin series of books by David Taylor II. The system was card-based. There was a persistent set of cards that made up the "character sheet," and then there was a shuffle-and-draw deck of cards particular to each character that affected task resolution. Also there were d4s, though modified to come out with 0-3 results instead of 1-4. Plus other dice, a couple gameplay currencies...there was a lot going on. This game is also slated for Kickstarter in 2019, and the public beta is currently available (for free!). Eric does a lot of cool work, and you can check out more of it at Four-in-Hand Games. (I'm personally a big fan of Rockalypse.) 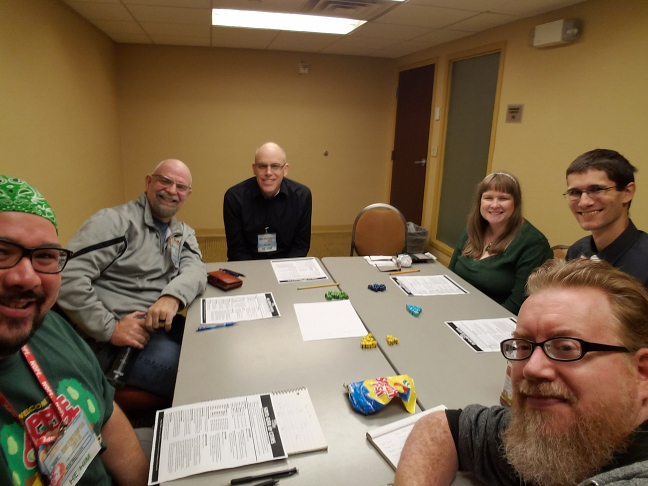 And just since he was the only other attendee at this session, I'll also throw in a plug for my friend Phil Vecchione, whose work you can check out quite a bit of at Misdirected Mark (as podcast host) and Encoded Designs (as game developer). 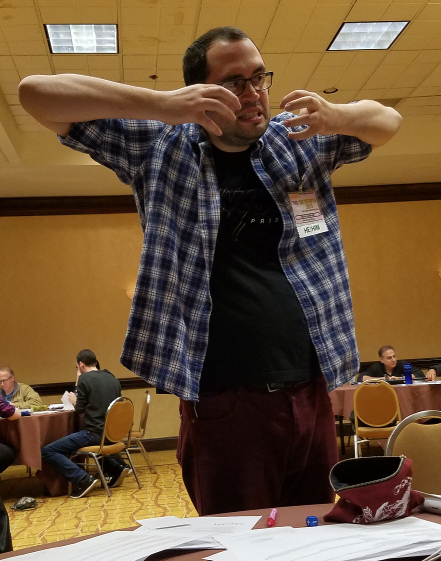 This was both my luckiest game of the convention (to find; my rolls were terrible!) and the most fun session I played in. I say luckiest because I wasn't previously familiar with the designer, but let's be real; it's rare indeed that I ever have a bad time at a game at this con. Besides just being immediately taken with the name "Rapscallion," I was also attracted to the description of swashbuckling adventure pirates. The game definitely delivered on that and more! This one is another Powered by the Apocalypse game, and the playbooks and moves all fell within that familiar structure. A standout for me was that the crew's ship gets its own sheet, as well, with one of a selection of different types available at chargen. There's a small amount of worldbuilding in the pregame, but it's mostly just deciding broadly on a setting (which is tied to choosing a ship). The playbooks were all exciting and evocative, and players immediately get a good idea of what this game is about. And it's about a lot! There's a base of high-adventure seafaring, for sure, but it also includes a slew of fantastical elements like weird magic. 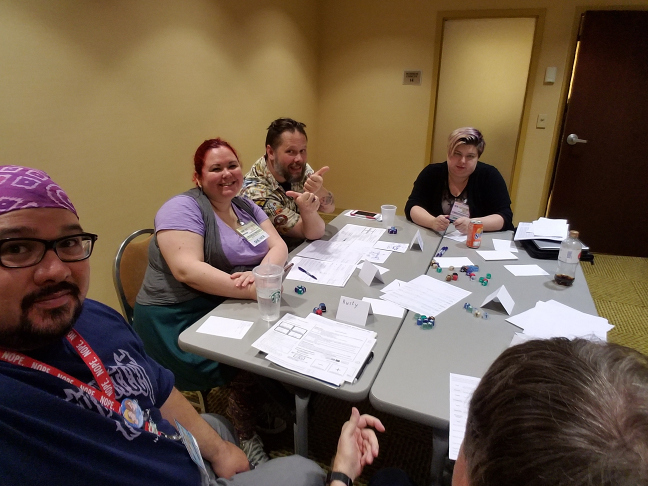 For our own session, we chose an airship-based option for the setting, and we wound up sailing the skies basically in a gondola supported by a gigantic floating jellyfish-like creature. There was a ship chase, boarding, swordfights, dark magic, cyclops romance, hat-stealing...just an overall fun time. This is definitely a game to watch out for. There's more info to be found on the Rapscallion RPG Facebook page, and you can see some of Evanleigh's illustration work here. Latest word is that this game got picked up for publication by Magpie Games, so keep an eye out for it! Around the table: Rob, Ronald, Corey, Beth, Julian, and Cam. On the table: Swedish fish. As a Cam Banks fan, I've been hearing about Pillar of Fire for a while now, but this is the first time I've played it, let alone really learned anything about it. It is very setting-heavy and also boasts a custom system, so it was a standout for me in that I don't have much to relate it to for reference. The setting is far-future sci-fi rife with genetic manipulation and artificial intelligence with a large dose of political intrigue and scientific-spiritual exploration. Humanity is governed by a number of different Houses whose members focus on particular aspects of society. Character templates are different combinations of three different factors: the brand of genetic manipulation that led to the character's biological characteristics, the House or Houses that influenced the character's upbringing, and the nature of the character's soul, which in this setting is a quantifiable factor stemming from the stellar system of their birth. The mechanics of the game were very interesting to me. It's based on a d6 pool, and the pass/fail mechanic is a sum vs. target number kind of deal. What's interesting, though, is that the roll also contributes a kind power point currency that allows players to use their special powers, and the mechanics are such that individual dice in the pool will either contribute to a successful check or grant power points for the future, but not both. I found it very neat! 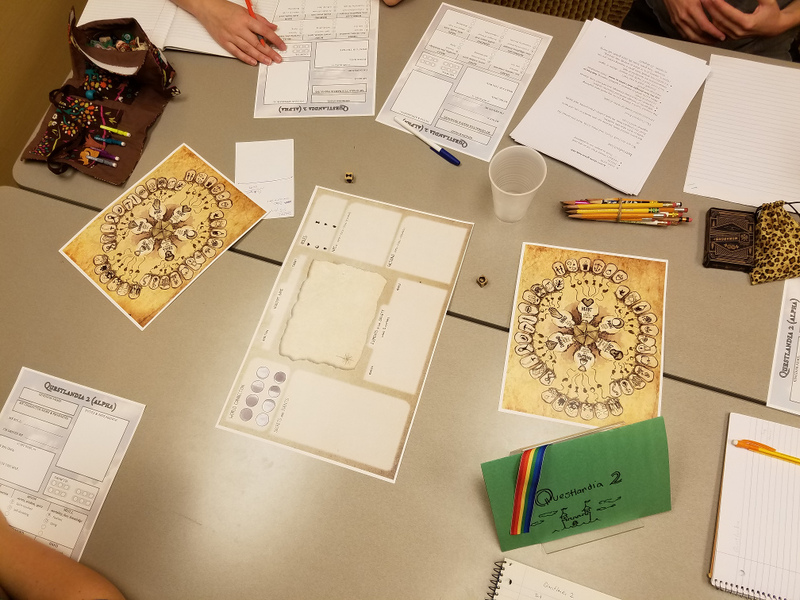 In particular for this session, we were testing a kind of extended task/group mechanic, so we forewent checks for individual tasks in favor of...basically each character contributing successes to a group pool in order to get a large task accomplished. There is a lot of interesting stuff going on in this game, so this is another one I'm eager to see in its final form. It'll eventually make its way to Kickstarter as well, so if you're interested in being notified, you can sign up with an email address here. You may or may not be familiar with the board game Root, possibly the cutest wargame ever. This was an early playtest of the RPG adaptation of that game. It's based on a Powered by the Apocalypse system, and we focused mostly on chargen and a brief adventure, so there's not a lot to go over as far as mechanics. One interesting piece that jumped out at me is that there is a sort of extra type of basic move that's tied to equipment, so you can do moves particular to carrying a dagger vs. a large sword, for example. As PbtA games tend to do, this game did a good job supporting its story genre, which I felt focused on a kind of action-espionage feel as part of an ongoing war. Like other games based on existing properties, this also has a lot of built-in setting, but none of it should be glaringly unfamiliar; the characters are anthropomorphic woodland creatures. 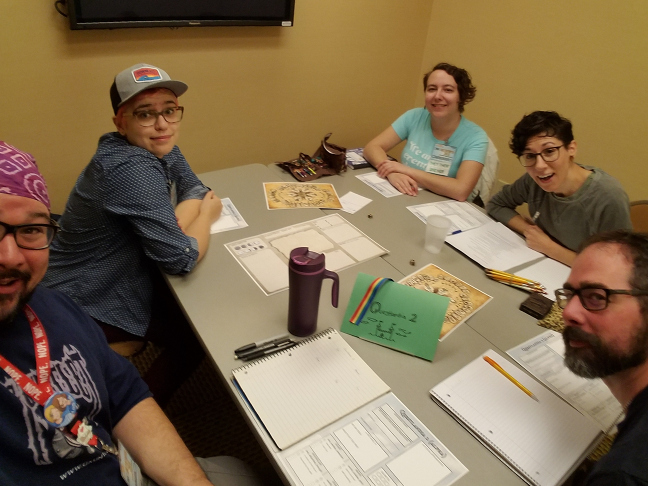 It was a fun session with no shortage of action or hijinks, and I think it makes a great basis for some good, clean action-fantasy fun. As I said, this was a pretty early playtest, so I imagine it will be in development a while yet (latest word is a Kickstarter scheduled for mid-2019), but you can keep up with it by keeping an eye on Magpie Games. 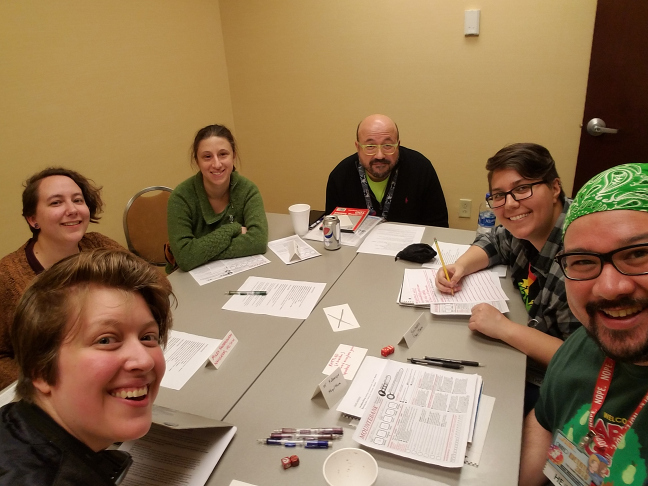 I think this was the most intense session I played at this con, made all the more sad because I forgot to take a group photo! Before playing this game, I was familiar with the designer mostly for putting cats in cyberpunk games (for example like this). This game is not like that. This game is about collectively trying to navigate a broken dreamscape of memory and imagination. It's a card-based game involving the construction of common tableaus to play from, and it's GMless in that the players take on a rotating configuration of roles over the course of the game. Everyone plays an aspect of one central protagonist, and everyone also contributes to the environment and NPCs and so forth. There's in-fiction confusion about what is dream or hallucination or reality, and the game fosters imaginative surrealism and emotional exploration. There's also a lot of first-person questioning of reality, and between that and the strong emotional themes, this is a pretty heavy game for me! But I love it. 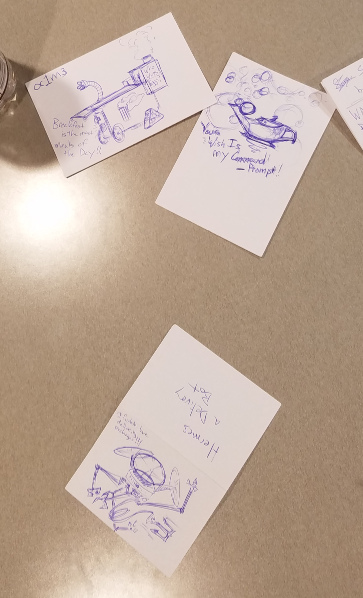 The card-based mechanics mean a very straightforward prompt-and-interpret mechanic for generating story, and the surrealist themes really lift a lot of the concern about going "wrong" with interpretation. Again, this game will need a lot of pregame tone discussion, and this one doesn't strike me as leaning in a goofy or zany direction. This one seems to invite a more...troubling?...kind of surrealism. As with others, I'm quite looking forward to this game's development. To also keep up with this game, I imagine you should keep an eye on Ardens Ludere. Robot Cities is a game about artificially intelligent robots living in a society without the humans that constructed them. The system is largely Fate-inspired, and the game seems to be geared toward mystery-type stories. Largely, though, the game is about making your way through a robotic world and coming to terms with your own sapience and (illegal) emotions and not freaking out the robots around you. This game approaches some deep questions, issues, and themes, but the tone can definitely head to the goofy. One of the characters in our party was an automated breakfast-serving trolley! It was a fun time, but I think this is going to be one of those games that will need tone discussion and player buy-in beforehand to really come together. I think it's also geared toward longer-term play, as it's largely driven by discovery, both about the world and the characters themselves, and I think that's the kind of theme that benefits from multiple buildups and reveals. Also there's a lot of pre-built setting, so being able to explore that in campaign play would also be rewarding. 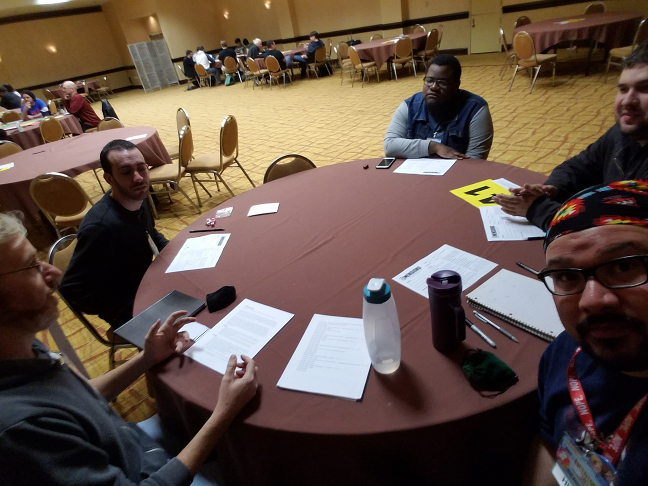 Metatopia was a bit over a month ago, and it only recently occurred to me that I never did a writeup of the con! I'll probably have less to say in this recap that I normally would. For one thing, it's been a month, so things aren't totally fresh in my mind. For another, I made a conscious effort to not over-schedule myself this year, which I think I did with moderate success. It's something I say to myself every year, honestly, but this year, I think I actually made the effort to do something about it. I made sure to leave time to get enough sleep and take decent meal breaks, and I think it did me a lot of good. I had a great time, as always, and didn't suffer much con drop afterward, so thus far, results are encouraging. 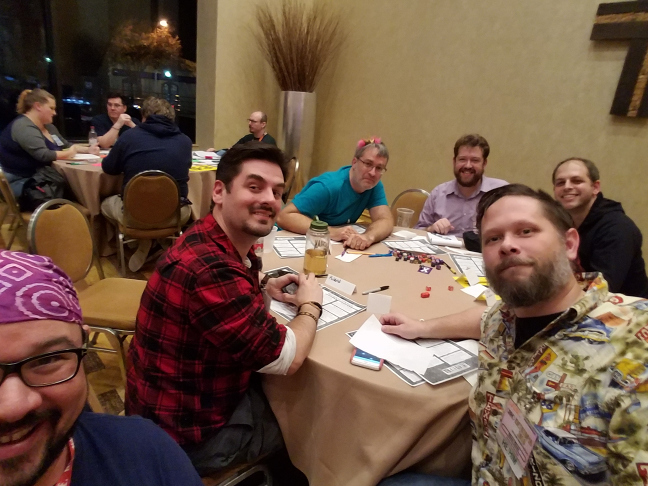 That said, for the reduced amount I'll have to say, Metatopia being what it is (a playtest-focused con with short slots), there are still plenty of games to talk about. Also I was much better about remember to take pictures this time. Let's get to it! Questlandia 2 is, you might gather, the next edition of Questlandia (from the same designers and publisher). While the first version was explicitly designed for one-shots, Questlandia 2 is being designed to support long-term play, and is a standout in the area of campaign games for being GMless. I won't go too far into the design, largely because if you're interested, you can check out the design for yourself! Questlandia 2 is being designed more or less in public on the podcast Design Doc, so I definitely recommend checking that out! The game is about exploring a series of doomed worlds by living the lives of inhabitants of those worlds. 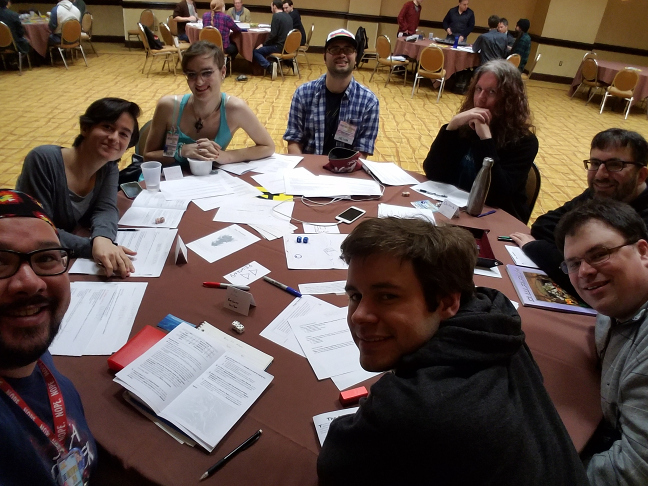 This playtest focused mostly on the collaborative worldbuilding part of the game which, as you may or may not know, is absolutely my jam. What's fun about Questlandia 2 is that this process is undergone many times over the course of a campaign, which makes this game many times my jam. 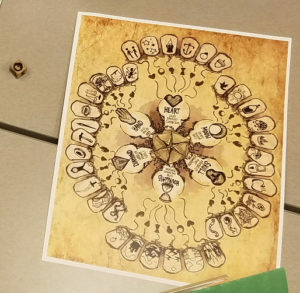 The worldbuilding is driven by narrative prompts fueled by a custom "alethiometer" which, for those of you unfamiliar with The Golden Compass or Northern Lights, is like a roulette wheel, except instead of a number you get a symbol or icon to spark ideas—imagine a 36-sided Rory's Story Cube. You fill in a series of narrative blanks and a little map, and you've got a world to explore. It's a lot of fun! Beyond being fun, the completed world also then informs a kind of mini-design that then lets you make characters particularly suited for that world. These are the second layer of characters in Questlandia 2, similar to how, say, a game about actors in different movies would have you (the player) play an actor (the PC) who is playing a movie character (the...whatever...sub-character?). The world we created was dominated by a kind of factory-state, as society paid lots of attention to the crafting of jewelry and accessories. The world was facing environmental and safety issues and material scarcity from overmining, and society-at-large had to deal with subversive elements in the form of underground artisans that insisted on creating their own jewelry without government sanction. There was also a fringe population of stargazers who maintained that the stars were trying to warn of impending doom. At this point, I can't remember all the characters; there was a miner who could navigate the dangerous mining chasm, some kind of mechanic-priest, a dilettante underground artist...it definitely all left me wanting to play the game! I'm very excited about this game. The worlds-within-worlds premise is exciting and strongly supported by the players-playing-characters-playing-characters structure. We didn't explore gameplay beyond the worldbuilding and chargen, but I'm eager to see how the system shakes out, particularly as contrasted to the first Questlandia. If you're interested in this game, be sure to check out Make Big Things, but also I recommend taking advantage of the unique opportunity to track the development of this game via the Design Doc podcast.